MARQUETTE, Mich.—Five Northern Michigan faculty members were honored at the annual Celebration of Excellence in Teaching and Scholarship ceremony. 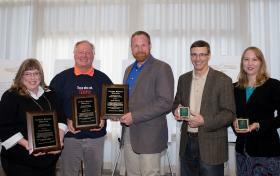 Award recipients were (from left): Kia Jane Richmond, English, and Steve Oates of the School of Education, Leadership and Public Service, both of whom received excellence in teaching awards; Derek Anderson of the School of Education, Leadership and Public Service, excellence in scholarship; and Dwight Brady, Communication and Performance Studies, and Kathryn Johnson, History, both honored for technology innovation. Richmond is the director of NMU's English education program. She is active in professional development and service through the National Council of Teachers of English, the Michigan Council of Teachers of English (for which she served as president in 2010) and the Conference on English Education. Richmond has published numerous articles in academic and educational journals, including articles on academic service learning and technology in the classroom. She is proud of the department's 100 percent placement record of the program's graduates. Oates has modeled stellar teaching practices for the thousands of students he has taught through his educational foundations courses. His Socratic methods are critical in the development of every teacher candidate and graduate student in the educator preparation programs at NMU. Utilizing his talents as a writer of young adult fiction and his stage presence as an actor who has performed in several productions, Oates has taught his students how to add an authentic voice to their thoughts and actions. Anderson has conducted a research agenda that has led to substantive changes in the planning, delivery and assessment of best practices in K-12 schools. His current research is on individual teachers’ religious or non-religious stance in their teaching, a line of research that has gone largely unstudied. He has also mentored dozens of graduate students through the process of completing their own peer-reviewed national and international scholarly works. Brady has consistently used cutting-edge technology in collaborating with students to produce award-winning products. These range from a CD of original songs produced in Nashville and mastered at NMU to a documentary that won a Michigan Emmy Award. Since 2009, students in his sports and special events class have been producing live coverage of NMU sports using HD television cameras, a mobile TV production unit and streaming audio and video live on the America One Network. Johnson participated in two pilot programs last year to enhance student retention by utilizing active learning strategies and teaching assistants in her large lecture world history course and engaging at-risk freshmen probation students. This year, she is building on her success by involving her students with academic service learning projects dependent on using technologies. Examples include video conferencing to connect to experts around the world, using a wiki to foster collaboration with a community partner and using iClickers to promote active student feedback and participation.